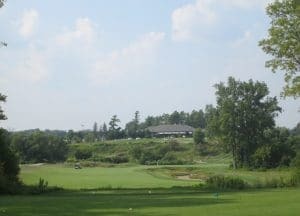 Although I have played FireRock Golf Club in Komoka since I first reviewed the course for SCOREGolf Magazine in the fall of 2004, that was my last writeup on the Thomas McBroom-designed upscale public layout. Nine years ago, I coined the phrase, Monet Meets McBroom, when describing this gorgeous piece of land just west of London. A lot has changed in the golf world since 2004, but one thing is for sure: FireRock GC has matured into a stunningly gorgeous 18-hole layout which will attract you with its beauty, then attack you with its classic risk-reward design. I have a lot more game than I did back in 2004, but perhaps not as much in the cerebral department, as I talked my partner on this day, Steve Fryer, into playing the back tees at 7,183 yards. Golf-mad London, Ont. waited a decade for a second upscale public club. Forest City National GC opened in 1993 to numerous accolades. 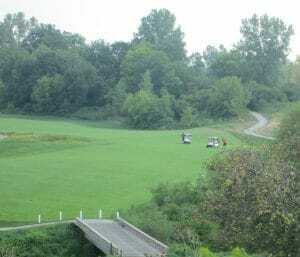 Opened in mid-July (2004), FireRock GC, a pitching wedge west of London in Komoka, is already drawing rave reviews for its delivery of beauty and brawn. Architect Thomas McBroom, with a mulligan from Mother Nature, has designed a masterpiece over 240 acres where a sand-and-gravel operation once stood. Father and son team Nick and Walter Spivak, who also own the nearby Oaks G&CC, pumped $10 million into this restoration project. The result: McBroom’s art piece which locals rank in the same category as destinations like Rocky Crest and Angus Glen. FireRock’s 11,000-sq.-ft. clubhouse, to provide a spectacular view of the Oxbow River Valley, will open in 2005. Its practice areas didn’t open until August, and the immaturity of the greens saw inconsistent speed throughout the course. No worries: if McBroom builds it, they will come. Oaks members have playing privileges, but there has been no short supply of visitors forking out $75 for the opportunity to test drive this seductive layout. Measuring from 5,672 to 7,098 yards, this par-72 track is best described by its creator, who labels it, “Explosive by nature and stunning by design.” No argument here. 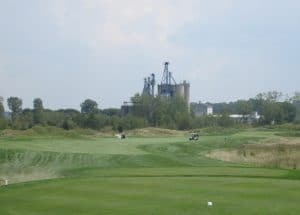 FireRock boasts nearly 100 acres of two-metre tall prairie and Savannah grasses that dominate the course with environmentally-protected wildflowers, herbs and shrubs. It’s Monet meets McBroom – a painting come alive, framed by natural grasses and trees, captivating land forms and ragged handmade bunkers, flowing over pastureland and across the valley. While FireRock’s fairways offer a generous number of safe landing areas, they can seduce you into choosing poor shot selections, thanks to a myriad of elevation changes. Once the large undulating greens mature, they will be dangerously quick. Add to the mix a cornucopia of strategically placed water hazards and bunkers, and you have the stuff of which legends are made. Two holes have dominated post-round discussions. The 228-yard par-3 third hole is cut through a canyon of old gravel spoils. An errant tee shot, slightly downhill to a bunker-less raised green sloping back to front, will forever rest in peace. Nasty fescue hills and primary rough as coarse as cabbage make for a challenging up and down. The hole’s handle is, “A short but unforgettable journey to Ireland,” but it’s more like a trip to hell. The 18th hole at FireRock is stunningly beautiful yet incredibly tough. Looking down into the valley from the tee, golfers are faced with a 443-yard par-4 finishing hole. 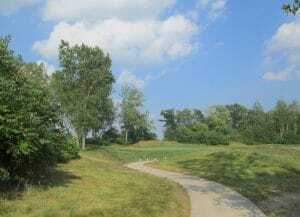 Hit long off the tee, and in the tight fairway, and you have a chance to get home in two over the Oxbow River. However, the smart play is to lay up before pitching onto a fast green with false front and front left bunker, and surrounded by mounds. FireRock is both beauty and beast, but don’t expect it to soften as it matures. No matter what your score, you’ll bring home memories of each hole. 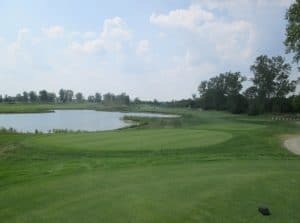 My crystal ball must be been shined brightly back then: indeed, over the course of nine years, FireRock GC – from the championship tees – is a brutal monster and even longer than when the course first opened for business. Thankfully, with additional tee blocks at 6,676, 6,279 and 5,672 yards, and for the most part generous landing areas off the tee, there are good scores out on this McBroom masterpiece. But it’s not a course where you want your wedge game to temporarily abandon you – and that’s exactly what happened to me on this day. I did, thankfully, drive it long and straight for the most part, at least giving myself a chance at a good score. But any missed drives meant trouble, just as my tee shot left at the 543-yard No. 1 proved. Hitting out of the rough, I was forced to muscle a mid-iron layup before hitting wedge and two-putting for par. This dogleg right is one tough starting hole. Although I bogeyed the 228-yard par-3 4th hole, I felt like I had won the lottery. With wind in my face, and in between clubs (a problem I had all day long), I decided to hit a low stinger off the tee with my 14-degree 3-wood. I airmailed the green, dropped three, and made a short putt for bogey. My only birdie of the day came at the 545-yard No. 7, one of the prettiest holes on the course with man-made pond along the left side of the fairway, and large green tucked around the bottom corner of the pond. My drive flirted with the left side of the pond, and my fairway metal landed 30 feet from the hole, from where I hit a nice lag putt and tapped in for birdie. Heading out at 40 (+4) I thought perhaps the best was yet to come. Boy was I wrong, as I went in at 41 (+5), ending my day with an 81 (+9). Although I fought hard for every shot, those 7,183 yards were just too much for me on this day. There were some bright moments, though, on the back 9. At the 428-yard par-4 14th hole, I chose risk and was rewarded after hitting driver over an enormous fescue-covered gravel spoil pile – a shot of about 270 yards from the back tees on this dogleg left. With an L-wedge in my hands and a tight lie, I failed to capitalize, leaving myself 22 feet to the hole on a tough green (which is artistically melded into an elevated hedge row that frames the 12th and 17th greens). I hit perhaps my longest tee shot of the day, and with the wind at my back, felt I had a chance to get home in two. Wrong. I landed short right in that aforementioned bunker, but was lucky to hit a nice sand wedge to within 18 feet, from where I two-putted for par. Few holes in London and area are talked about as much as FireRock’s finishing hole. 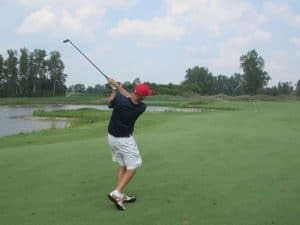 In fact, a few years ago I brought my TV show, Forest City Fairways on Rogers TV, to FireRock and challenged head golf professional Duane Swinkels on the 18th hole. You can watch that video here (at 4:07). Although my score was the same this time around (bogey), I did so with a much-improved golf game, but as mentioned a wedge game that, ironically, was working well in that video. My drive yesterday from the 454-yard tees left me with only 163 yards to the hole. But my ball had landed on top of the ridge at the bunkers near the cart path, and I was forced to hit a hybrid above my feet into a strong wind. This time I landed in the deep bunker to the left of the green, from where I still left myself about 15 feet for par. I two putted and once again bogeyed FireRock’s finishing hole. Before our round, I chatted with Swinkels in his office, where he showed me some of his memorabilia with baseball’s Pete Rose. Swinkels laughed when I told him we were playing from the tips on this day. But there was no hustle on this day, as I knew exactly what I was getting into from 7,183 yards. I was, however, a great day to enjoy a Thomas McBroom course which continues to draw praise from local golfers and out-of-town visitors alike. FireRock also does a great job in balancing a busy charity tournament business with membership and green fee paying golfers. And for an upscale track that draws so much traffic, the greens were in great shape – not overly quick, but consistent and well kept. I enjoyed my round at FireRock and look forward to my next round September 17 at the 9th Annual Unity Project Golf Classic for relief of homelessness in London.